79 Trillium 4500 Where do I start!? Just not sure how to proceed with the belly band project, I would guess that the gap left by the alum. could be filled with automotive fiberglass body filler (AKA Bondo) sanded and painted. I haven't worked with the stuff and am afraid of the can-o-worms aspect. I think that the wife would rather I adhere to the "if it aint broke, don't fix it" moto. If you are planning to put the wide rubber trim on (like the green one above), then you can be quite a bit less artistic in your filling. You will still want to be careful about prep, and level the surface, but it won't have to look like glass (which, if you are painting will be more demanding of final fairness). Personally, I'm not a fan of bondo on fiberglass. But that's because I come from a boating background, and on boats it doesn't perform as well as something like epoxy filler. You might be able to get away with bondo on a trailer; I'm just not sure. Why not take a look at the belly band attachment plates from the inside? If they are not rusted and bulging... Oh wait, did you say someone had re-riveted the band on yours and thus penetrated the shell to the inside? If so, and if the band is well-adhered on the outside and looking good, you could also just put a layer of fiberglass on the inside where you have holes (smooth off any protruding rivet end first). If you do that, you'll have it really easy on the cosmetic side of things, although you'll have to peel back and then re-glue some ensolite. Could you show some photos of what you have? I manufacture skis for a living, so I'm used to epoxy and glass, but the epoxy I'm used to is the viscosity of honey (kinda' tough to stuff into a vertical surface). I think I have seen a 2 part marine epoxy with a viscosity more like thick peanut butter; that might work if it won't sag to much. Pics. of my problem won't really help, as it's not really a problem...yet. 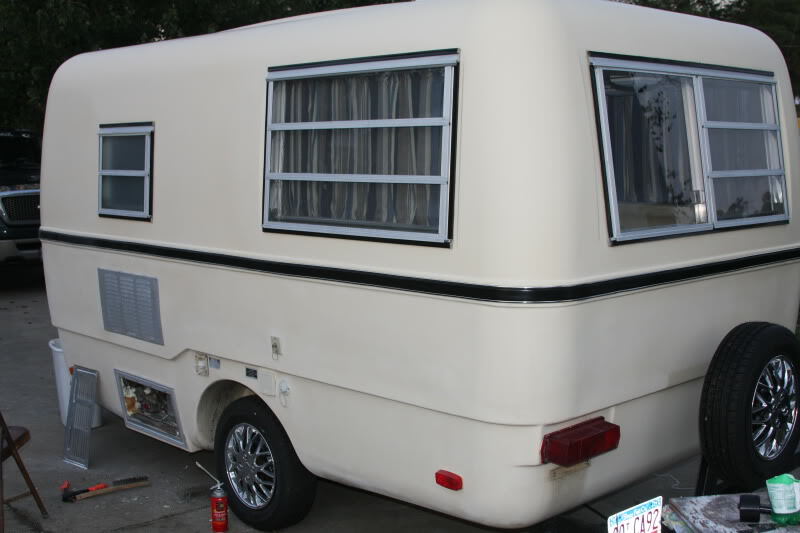 I'm considering a full, exterior, paint job over the winter, this seam, seems like a likely future issue and nipping it in the bud, from the outside seems smarter than waiting for a problem, and peeling foam on the inside (the inside ensolite is my trailer reno. fobia). Skis, that sounds fun. And Telluride... of course! It sounds as though you may be working with "neat" epoxy. That is, just resin and hardener mixed together in a specific ratio. Honey sounds about right. To make thickened epoxy, you just stir in one or more thickeners, depending on what you want the epoxy to do. Some fillers make it stronger, some make it less runny, and others make it easier to sand. They're not too expensive, and you just stir them in after you've mixed the resin and hardener. No measuring is necessary as you just start with a small amount and keep adding until you get the right consistency for your use. They usually are described as things like "mayonnaise, ketchup, peanut butter" and etc. so that it's pretty universal. WEST System is one popular brand of epoxy products and they put out an absolutely fantastic "User Manual" that is free and is packed with information about how to mix, what to use each thing for, and techniques for bonding, fairing, patching... you name it. These same techniques will work with most any brand of two-part epoxy and generic or "other brand" fillers, too. I'd highly recommend it. I happen to have one right in front of me, and it's part number 002-950 It's completely free. You can also look at each chapter online at the address below. The first sections, where each thing you can click on has a line illustration of a hand doing the various steps is the book, chapter by chapter. Other common brands of epoxy resin used in boating are System Three, Raka, and MAS (plus there are others). I would be thinking along the same lines as you are if I were considering an exterior paint job. That would be the time to take action on the belly band, whichever method you settle on. Can you give a part number/source/where you got it, for future reference? By the way, I got some metal badges for the grille of my car (Volvo used to give out a badge for every 100,000 miles), and they came with that white foam stuff adhered to the back that you then peel a bit of paper off and then stick on somewhere. I had my doubts (and actually made a backup of metal/wire/3M 5200 caulk), but that stuff has been sticking like the devil even on the front of my car. Not that your solution isn't good too, but that stuff might be better than it would seem. Thanks for the post. Trim looks great, but I'm curious what it looked like after the body work. I'm still considering the no trim look. Is the trim ness. to cover the seam, or could it be filled and sanded to look good? I'm planning on painting the whole exterior. 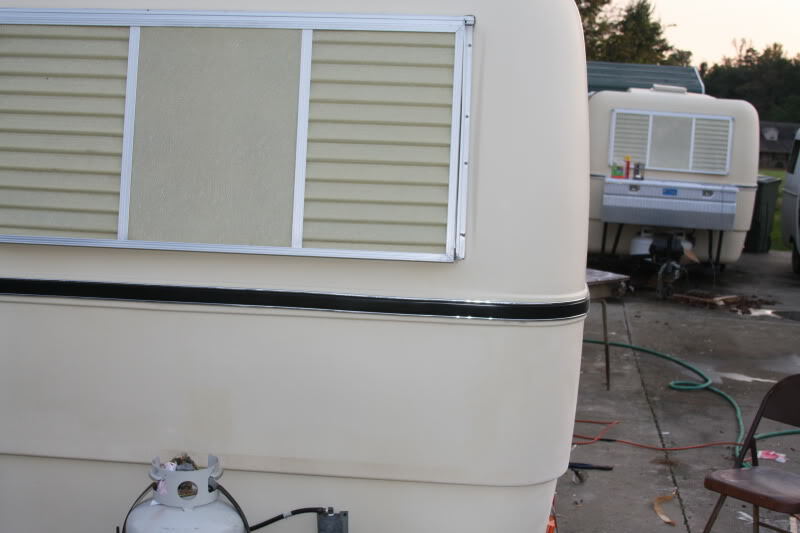 On a second note; how did you get your fiberglass window covers to look so great? Mine was repainted and is now a peeling mess. My weekend consisted of reconfiguring the tongue to fit 2 T-105 batteries and 2 propane tanks. Mounted the TV. Ordered the new axle, 14" wheels and tires, new 2" coupler and jack, new crank down rear stabilizers. Now I'm home icing my wallet! Mine looked pretty awful on the outside but were like new on the inside - so I unscrewed the window guard as best I could and flipped the panels around.